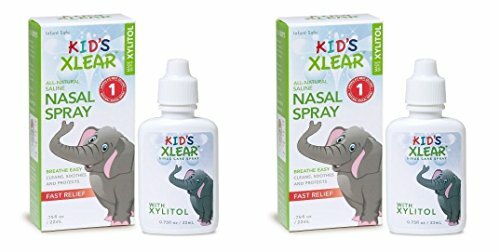 XLEAR Kid’s Nasal Spray (Pack of 2) With Xylitol, Saline, Purified Water and Grapefruit Seed Extract, To Moisturize and Soothe Children’s Nose and Sinuses While Alleviating Congestion, .75 fl. oz. This bundle includes two .75 fl. oz spray pumps of XCLEAR Kid's Xylitol and Saline Nasal Spray. Kid's Xlear Saline Nasal Spray with Xylitol was developed with children in mind. It's a drug-free, kid-friendly nasal spray that contains xylitol-a natural ingredient that cleanses and moisturizes. Normal saline nasal sprays can dry out the nasal passage, actually leaving it more irritated and susceptible to external contaminants. But with the addition of xylitol, our natural kid's nasal spray will moisturize and soothe your child's nose and sinuses while alleviating congestion. Xylitol also cleanses; it's almost like soap for your child's nose. As it cleans, it gets rid of harmful bacteria and allergens, giving a better chance for your child to not get sick. It also offers congestion relief, allowing your child to breathe more comfortably. Patented solution with Xylitol reduces tissue inflammation and naturally opens airways. Kid-friendly .75oz bottle delivers a gentle mist when squeezed or can also be dispensed in drops. Hypertonic solution is more effective than saline alone at rinsing, cleansing, and moisturizing. Non-GMO Project ingredients guarantee the products you put in your body are natural. Drug-free formula can be used as often as needed. This bundle includes two .75 fl. oz spray pumps of XCLEAR Kid's Xylitol and Saline Nasal Spray. Kid's Xlear Saline Nasal Spray with Xylitol was developed with children in mind. It's a drug-free, kid-friendly nasal spray that contains xylitol-a natural ingredient that cleanses and moisturizes. Normal saline nasal sprays can dry out the nasal passage, actually leaving it more irritated and susceptible to external contaminants. But with the addition of xylitol, our natural kid's nasal spray will moisturize and soothe your child's nose and sinuses while alleviating congestion. Xylitol also cleanses; it's almost like soap for your child's nose. As it cleans, it gets rid of harmful bacteria and allergens, giving a better chance for your child to not get sick. If you have any questions about this product by Xlear, contact us by completing and submitting the form below. If you are looking for a specif part number, please include it with your message.